The first member of a revitalized series of spaceborne weather watchers was shepherded into orbit by a Delta 4 rocket in a marathon Wednesday evening launch, giving American meteorologists a sophisticated new tool to warn against dangerous severe storms. Fitted with a pair of 60-inch diameter solid rocket boosters for added kick, the Boeing-built Delta 4 zoomed away from Cape Canaveral's Complex 37B at 6:11 p.m. EDT (2211 GMT) with its hydrogen-fueled main engine blazing. In just under 13 minutes, the Delta 4's second stage had arrived in a low-altitude parking orbit. Two more firings of the RL10 cryogenic engine powered the stage higher above Earth and moved the orbit closer to the equator. The Delta 4 deployed America's newest 6,900-pound weather satellite at 10:32 p.m. EDT (0232 GMT Thursday). Orbital parameters were not immediately released. As the 13th member of the fleet of Geostationary Operational Environmental Satellites, or GOES, the craft will appear fixed above Earth once it reaches its final orbit after a series of five adjustment burns due to begin Friday. The maneuvers will last for about a week, gradually raising the low point of the orbit until it reaches a circular geostationary altitude about 22,300 miles high. It will be glided into a slot positioned along the equator at 90 degrees West longitude for testing. Now known as GOES-N, the craft will be formally renamed GOES-13 after its circuitous trip to its destination orbit is complete. 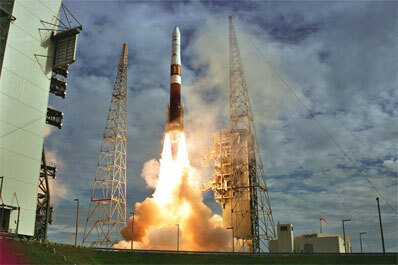 The launch was conducted under the commercial oversight of Boeing Launch Services on behalf of NASA. GOES-N was also built by Boeing's Space and Intelligence Systems unit and is based on their heritage Boeing 601 model. GOES-N's 27-foot solar panel - critical to the mission due to its vital electricity production - will unfurl in two parts on June 5. Other activations and deployments will continue for a few more days until June 17, when control of the craft will be handed over from Boeing to a team consisting of NASA engineers for continued post-launch tests. Tentative plans call for the first visible image from GOES-N to be taken on June 27, followed a few days later by the first data from the Solar X-Ray Imager, which gives forecasters warning of space weather events by looking at solar flare emissions. After 200 days of testing and checkout activities, NASA will formally give its seal of approval for the craft in December. The agency will then hand over the satellite to its operator - the National Oceanographic and Atmospheric Administration, or NOAA - to begin its 10-year mission, an improvement of three years above previous GOES satellites. The weather observatory also has a larger load of fuel to last almost 14 years. However, GOES-N won't enter service immediately. NOAA officials will first put GOES-N into storage as an in-orbit standby satellite for the GOES constellation. To see much of the western hemisphere from the International Date Line to the central Atlantic Ocean, the GOES program has most recently used GOES-10 in a western location at 135 degrees West and GOES-12 farther east at 75 degrees West. GOES-11 has served as a spare since its launch, while the aging GOES-9 is located at 155 degrees East where its instruments help Japanese forecasters observe weather throughout much of Asia and the western Pacific Rim. GOES-10 was formally retired on Monday due to the depletion of its fuel system, and controllers commanded GOES-11 to transition to the operational orbital slot currently occupied by GOES-10. The nine-year-old craft has been operational since 1998, while GOES-11 has been on standby since its launch in 2000. However, GOES-10 will not be taken out of the constellation until the health of GOES-N is confirmed in around three months. Next for GOES-10 will be a move to 60 degrees West to cover Latin America. Assuming no unexpected failures, GOES-N could replace GOES-12 in daily operations sometime between 2008 and 2011. Officials are pleased with the addition of GOES-N because it would take just days to press the satellite into service if needed, while spacecraft in ground storage could take a year to be launched and declared operational. It is also less expensive to store back-up satellites in orbit than for the craft to occupy factory space on Earth. The fleet collectively takes visible, infrared, and water vapor images every 15 minutes, or every half-hour for each operational satellite. The pictures are used by meteorologists to keep track of local weather events for short-term forecasts. Such images are ideal for not only looking at severe weather such as tornadoes and hurricanes, but also for observing more large-scale weather systems such as fronts and low and high pressure centers. They allow meteorologists to monitor the development and lives of storms, aiding in more rapid watches and warnings in threatened regions. "Images from GOES are not just colorful images that we see on our weather forecasts every night on TV, but also will predict and warn of atmospheric triggers that change weather and environmental conditions in an instant," said Steve Kirkner, GOES program manager at NOAA. "These warnings will lead directly to the saving of lives and the reduction of property damage." The 2006 Atlantic hurricane season officially begins in one week. The National Hurricane Center earlier this week predicted yet another active season this year. "There's very little in our arsenal which allows us to gather data from the entire ocean basin around the storm and, in fact, the entire hemisphere to be able to look at the weather patterns that are taking place on an hourly basis and even more often," said Steve Letro, meteorologist-in-charge at the National Weather Service forecast office in Jacksonville, Florida. "For that, we have to look to the satellite community." An improved attitude control system debuting on GOES-N will help controllers pinpoint exactly where threatening storms and severe weather are located. Star trackers will produce navigation data to double the earlier precision from three kilometers to one-and-a-half kilometers. The imager is the source of the pictures and loops often seen in television weather broadcasts, and is the most prominent instrument in the eyes of the general public. In addition to the imager, an atmospheric sounder is also carried aboard GOES satellites. The sounder studies temperatures, moisture content, and ozone distribution at different levels of the atmosphere. This vertical data is better suited to long range outlooks over a few days in length. GOES-N incorporates more capable batteries to conserve enough power for the craft to continue capturing images during long eclipse periods where the Sun's rays cannot charge its batteries. Thermal shields have also been added to block the damaging light of the Sun during certain parts of the satellite's orbit, which in the past has limited imaging and sounding activities. The enhancements will lead to over 600 more images and sounding runs per year, principally during the spring's active severe weather season and the autumn's peak of the hurricane season. "Gaps in data would disrupt the National Weather Service's ability to predict not only hurricanes but also tornadoes, flash floods, and other severe weather," Kirkner said. "I can tell you there are few things more frustrating as an operational weather forecaster than to be sitting and depending on that data, and then all of a sudden it goes into an eclipse and it's no longer available," Letro said. Other advances are concentrated in the data collection and relay systems aboard GOES-N, yielding more communications and storage options for ground controllers. "GOES-N will include two phases of improvement, first better measurements and second a better distribution of data products and warnings," Kirkner explained. "You're not going to see these things as big changes in the way satellite imagery is depicted on TV, or in the satellite loops that you see, or in the things that your TV weather forecaster is going to use to try to get you to understand what the nature of the threat is," Letro said. Instead, new data gathered by GOES-N will greatly contribute to the crucial behind-the-scenes analysis of storms. GOES-N also carries Lockheed Martin's Solar X-Ray Imager that is designed to detect and precisely locate solar flares and coronal mass ejections soon after they happen, giving forecasters an opportunity to determine which events will impact Earth. Charged particles reaching Earth can cause radio and electrical outages, damage to orbiting satellites, and dangerous exposure to humans outside the planet's natural radiation shield. The 30-year old program's first solar imager was launched in July 2001 aboard GOES-12, but it experienced an "instrument degradation" in November 2003 after about a year of normal operations. Improvements were made to GOES-N's solar instrument, and a longer life is expected for this imager. A separate suite of instruments aboard GOES-N comprise the space environment monitor payload, which keeps tabs on the local conditions around the observatory and X-rays, extreme ultraviolet levels, and other particles produced by solar activity. The spacecraft will also contribute to the world's foremost international search and rescue system that uses satellites to help track people, land vehicles, airplanes, and ships in distress by use of a dedicated on-board transponder and the GPS system. GOES-N is the first of three upgraded Boeing-built weather satellites ordered by NOAA in 1998 to continue the highly successful GOES program for another decade. 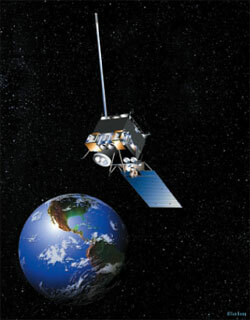 GOES-O is currently in ground storage and could be launched in September 2007, if needed. Otherwise, managers are planning for its launch in April 2008. GOES-P is undergoing thermal vacuum testing before being placed in storage before its scheduled launch in October 2009. Officials will then prepare for the rollout of the next-generation GOES-R series in about 2012. Besides the high-altitude geostationary-based GOES satellites, NOAA also utilizes a pair of polar-orbiting environmental satellites. These craft are used to monitor long-term climate changes with an array of instruments to provide a closer look at weather systems. Wednesday's launch had been postponed from its initial target launch date last summer due to a slew of issues. The Delta 4 rocket had been sitting on the launch pad since February 2005. Problems with the rocket's flight termination system batteries, the replacement of the Delta 4's guidance computer, concerns with the GOES payload's communications system, and other issues combined to force a delay until the middle of last August, when two consecutive launch attempts ended in scrubs. The mission was then pushed back to October because of expired flight termination system batteries and to bypass a period where the GOES spacecraft would not receive adequate sunlight for power production during the mission's early test and commissioning phase. Continuing problems with flight termination batteries and a machinists' labor strike conspired to further postpone the mission to May. Boeing eventually chose a new battery supplier, while the machinist's union agreed to labor contract terms and work resumed in early February. During the lengthy delay, the Delta 4 rocket and the attached GOES-N satellite weathered a threat from Hurricane Wilma, whose 60 mile per hour winds lashed the launch complex in late October. In February, officials also decided to remove the spacecraft from atop the Delta 4 to return to the nearby Astrotech processing facility for inspections, cleaning, and further testing. GOES-N was transported back to the launch pad on April 28 and hoisted on top of the Delta 4's second stage two days later. The rocket's first stage RS-68 main engine gimbal actuators were then removed and replaced, delaying the launch to May 24. Boeing's launch team can now focus preparations for the next mission of a Delta 2 rocket that is slated to deliver two defense research satellites into orbit from Cape Canaveral on June 19. Components of that vehicle are already being stacked at launch pad 17A. Meanwhile, a Delta 4 rocket is currently scheduled to debut the company's new West Coast launch site at Vandenberg Air Force Base, California, on June 27. That flight will carry a top secret craft for the National Reconnaissance Office - the government agency in charge of U.S. spy satellite operations. Florida technicians will continue processing for the next Cape Canaveral Delta 4, due to fly in late January of next year. The last Defense Support Program missile detection satellite will ride aboard the second flight of the Delta 4-Heavy version of Boeing's expendable family. That vehicle - already fully assembled - is slated to be lifted atop its launch pedestal at Complex 37B in a few months. Before then, crews must complete a set of modifications to the launch pad to allow it to support the DSP launch. Last year, engineers devised a fix to a propellant cavitation problem with the Delta 4-Heavy's three giant common booster core stages that are strapped together in the early phase of ascent. That issue caused the trio of RS-68 main engines cut off a few seconds earlier than planned on the maiden launch of Delta 4-Heavy in December 2004, resulting in a failure to reach the mission's desired orbit. Wednesday's launch marked the first Delta 4 mission since that Heavy test flight. To date, Boeing's new rocket program has now amassed a total of five launches since its first in November 2002, and the entire Delta fleet has flown 315 times in over 40 years of service.